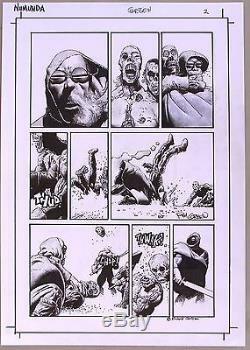 RICHARD CORBEN ORIGINAL ART from Dark Horse Presents Vol 3 #1. From the "Necromancy of Numunda" section of Murky World. The item "RICHARD CORBEN ORIGINAL ART Dark Horse Presents Vol 3 #1,2011 Numunda, Signed" is in sale since Thursday, August 25, 2016. This item is in the category "Collectibles\Comics\Original Comic Art\Interior Pages". The seller is "amazing-adventures" and is located in San Mateo, California. This item can be shipped to United States.